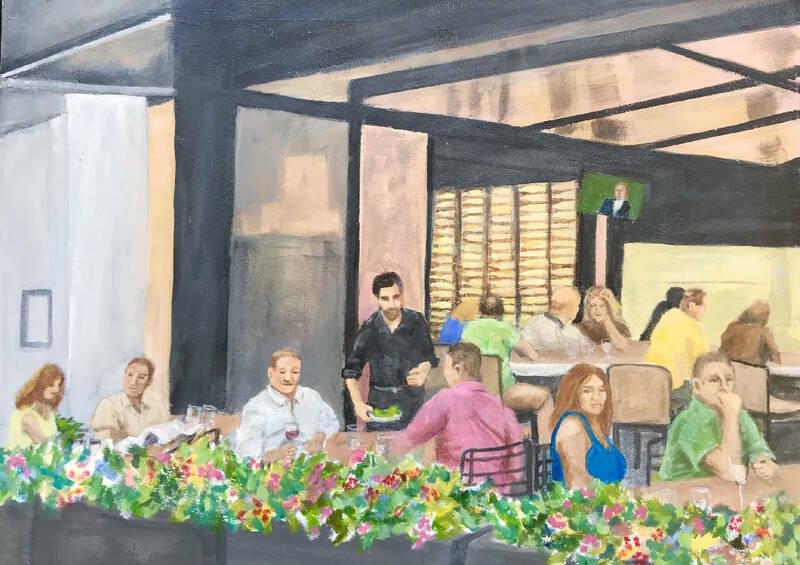 "Dining in West Village" depicts a scene in front of the former Gilman Paint store, now a restaurant. "There weren't art stores like Art Creations back then, so we would get our paints and brushes at Gilman's. It was kind of a funny feeling to come back and find it was now a restaurant," says artist Jennie Kirkpatrick. › Association for Visual Arts, 30 Frazier Ave.: “My Story: Life as a High School Student,” 5:30-8 p.m., work by local high school students. Exhibit remains on view through Dec. 22. 423-265-4282. › Creative Arts Guild, 520 W. Waugh St., Dalton, Ga.: Work by Kevin Bate and W. Locke, 5:30-7:30 p.m. 706-278-0168. A reception Friday night, Dec. 7, at In-Town Gallery will open Jennie Kirkpatrick's show, "Scene in Passing: An Artist Views Chattanooga." The reception will be held from 5 to 8 p.m. at the gallery, 26-A Frazier Ave.
Having traveled to many places around the world, Kirkpatrick uses those experiences to examine her hometown. From the West Village to Coolidge Park and the Chattanooga Theatre Centre, Kirkpatrick looks at her city with an eye attuned to the magic of everyday moments. Kirkpatrick, who works in watercolor and acrylic, has a fine arts degree in painting from UTC and a Master of Fine Arts in graphics/printmaking from George Washington University. She has taught drawing, design, art history and art appreciation at UTC, Cleveland State Community College and Tennessee Wesleyan College. The idea for "Scene in Passing" arose during a weekend spent with two former college roommates. "Playing tourist in my own city, I found myself looking at Chattanooga with the same artist's eye I've brought to cities and places all over the globe. I suppose it's not surprising that many of the paintings in this show are from that weekend," says the artist. "Scene in Passing" will remain on display through Dec. 31. For more information: 423-267-9214.